It’s been a long time since we cooked Red Bean and Lamb Casserole, a Supercook favourite. It’s an adaptation of an Iranian dish. Cubed lamb is casseroled in chicken stock with onions, garlic, tomatoes, kidney beans, turmeric, salt, pepper, lemon juice, coriander and mint. Yoghurt is stirred in at the end and the dish is garnished with parsley. We served with mashed potato and roasted courgettes. 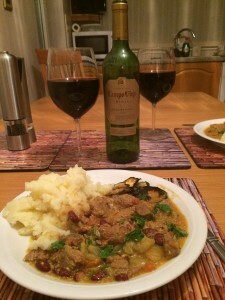 We initially tried to pair the meal with Glorioso Crianza Rioja 2011, a medium-bodied Spanish red from the Wine Society, but surprisingly the flavours of the lamb casserole did the wine no favours, so we set the wine aside. We thought a wine with more sweetness might be better and opted for a bottle of Campo Viejo Rioja Gran Reserva 2009, a medium-bodied Spanish red that is a blend of Tempranillo, Graciano and Mazuelo. We last enjoyed this with a lamb korma. We detected intense red fruits on the nose with vanilla sweetness, black and red fruits and a slight mocha finish. A good match, but we have enjoyed better pairings with this wine. For the leftovers we decided to switch to a bottle of Prospector Shiraz 2013, a full-bodied Australian red from Naked Wines that we had enjoyed previously with a beef carbonnade. We detected black fruits on the nose with vanilla sweetness and intense red and black fruits on the palate. The finish was smooth, peppery and spicy. The wine was a slightly better match than the Rioja, but we were left wondering what wine would have been a really good match.